From Saturday 22 October to Wednesday 2 November 2016, NAUSICAA will be hosting Shark Week. Sharks have always had a reputation of being bloodthirsty predators, man-eaters in fact! Actually, this is far from the truth. Of the 500 species of shark found in the world’s oceans, very few pose a threat to Man. In most cases, they are fearful and distrustful of humans! However, they are right at the top of the marine food chain and, as such, they play a vital role in maintaining the balance of animal populations. Man is the shark’s main predator, killing more than 100 million of them every year, mainly for their fins! So, surprisingly, the more dangerous of the two is not the one you might think! This year, NAUSICAA is taking a close look at this amazing creature in a fun and educational way. Visitors can increase their understanding of sharks through activities designed for the whole family, such as, meetings with shark handlers, live broadcasts with correspondents from NAUSICAA’s TV studio etc. NAUSICAA has been showing sharks off to visitors since it opened in 1991 and, at present, the displays include more than 140 animals including bull sharks, leopard sharks, zebra sharks and grey sharks. Family workshops will provide a different view of sharks by showing visitors what shark eggs look like or using a microscope to see what certain sharks eat. At the end of the workshop, visitors will have a chance to make a shark fortune-teller and share their knowledge of these lords of the seas! Are you afraid of sharks? This event will help you find out more about sharks and the important role they play in the world’s oceans. We still have so much to learn about these fascinating animals. €2.80/person or €1.40 for visitors to NAUSICAA. Every day, a shark handler will meet visitors to NAUSICAA and tell them about the various aspects of the job, in particular diving with sharks. He will also describe the risk to shark populations, their place in the ecosystem and the importance of a conservation policy for these animals. and describe how they are carried out. They are necessary to keep the glass walls of the pool clean. They also allow the divers to check the decorative features in the pool and monitor the health of the animals. He’s sure to have a few good stories to tell about these unusual dives! Find out more about sharks through the documentaries and live broadcasts with shark experts, for example how long does a great white shark live and how do sharks breed? You can also try and win a shark’s tooth by answering a quiz about sharks! Bernard Seret, who trained as an oceanographer and biologist, is now a fish scientist and a retired researcher from the Institut de recherche pour le développement (IRD). He has been studying the biodiversity of shoals of fish for almost 30 years, taking part in numerous expeditions and research programmes. He has some 200 publications to his name, including descriptions of 44 new species and books for the general public. His work also covers biology and fishing for sharks and rays. As an expert in this field, he advises national and international bodies and has helped to draft a number of action plans for the management and conservation of shark populations. After the screening of the film, “Méditerranée, le royaume perdu des requins”, by Stéphane Granzotto and François Sarano, Bernard Seret will share his knowledge of sharks with the audience – the number of known species, the state of shark populations, recent discoveries etc. Search for catsharks’ egg cases on local beaches and bring them to NAUSICAA. This will help researchers at Ifremer to find out more about a shark that lives on our coasts, the catshark, and improve their knowledge of conservation. Support the LONGITUDE 181 association by clicking on the Web! To support LONGITUDE 181 every day without it costing you a penny, simply replace your usual search engine with LILO. The LILO search engine is against advertising. It redistributes all advertising income to NGOs. Here’s how it works: every time you conduct a search, you are awarded “drops of water” which you can allocate to the project of your choice at any time. It’s up to you to choose the project to which you want to give your drops of water and LONGITUDE 181 is one of the projects available. Every trimester, your drops of water are turned into euros. Number of sharks at NAUSICAA: NAUSICAA is home to over a hundred sharks. 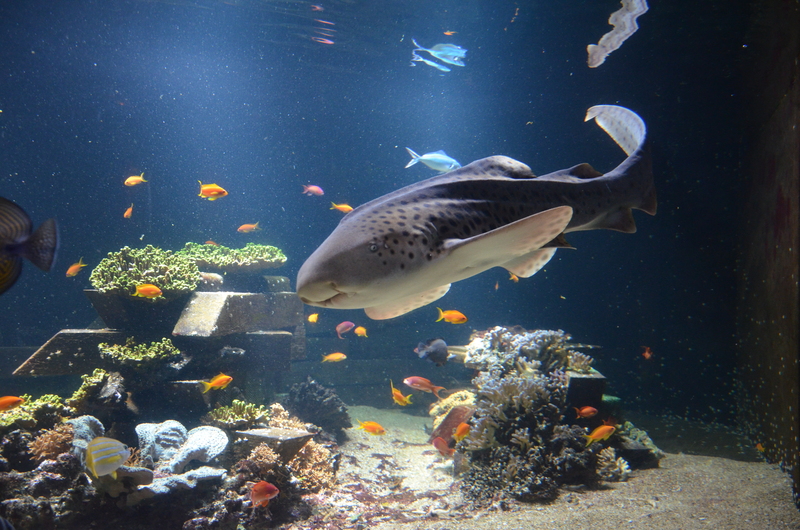 Number of species: there are more than ten species of shark at NAUSICAA. Species in the NAUSICAA displays: grey shark, bull shark, nurse shark, stroller shark, starry smoothhound, carpet shark, leopard shark and zebra shark. Shark displays: the sharks can be seen in the “Open Sea” area, the Californian basin, the tropical lagoon, the touch pool (yes, catsharks are part of the shark family) and the “Islands Stories” exhibition. The oldest sharks: A shark lives for 30 years on average. Four of our sharks (1 bull shark and 3 grey sharks) have been living at NAUSICAA since 1991. Births: There are frequent births among our European coastal sharks (small spotted catshark and nursehound) and our involvement in various breeding programmes is expected to lead to births in other species in the near future.